You could win up to £100 in our monthly lottery draw and help to fund the services and support that Autism Berkshire provides to people living with autism throughout the county. As well as the £100 top prize, there is a second prize of £50 and there are nine further prizes of £10 each. Tickets are priced £5 per month. You can buy more than one ticket for each monthly draw. To join the Autism Berkshire Lottery, click here to download an application form, which should be completed and returned to our office in Reading. The winners will be notified by email. Prize money is paid into the winners’ bank accounts. All players must be aged 16 or over. Please arrange a standing order with your bank – payments should be made to CAF Bank, 25 Kings Hill Avenue, Kings Hill, West Malling, Kent, ME19 4JQ. Account number 00021540, sort code 40-52-40, for the credit of Berkshire Autistic Society. We also accept cheque payments for purchases of Autism Berkshire Lottery tickets for periods of six or 12 months. Cheques should be made payable to Berkshire Autistic Society. 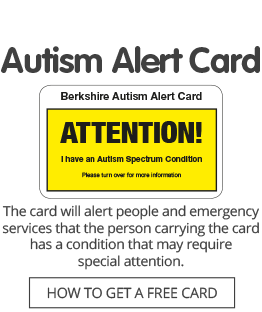 The Autism Berkshire Lottery is licensed by Reading Borough Council, number LOT000102. Click here to download the full terms and conditions of the Autism Berkshire Lottery. Click here to download our lottery policy. Click here to download a self-exclusion form if you would like to be excluded from future lottery draws. If you have a gambling problem and want to talk to someone, you can contact the trained counsellors at GamCare. Call 0808 8020 133 or visit the website gamcare.org.uk. The GamCare helpline operates between 8am and midnight, 7 days a week, 365 days a year. Calls outside these hours will be taken by a recorded message service and a counsellor will contact you.